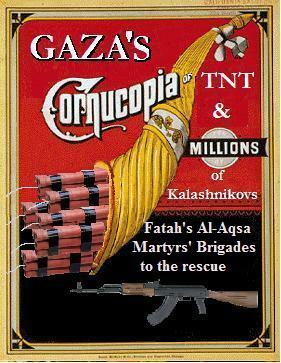 FATTAH’S AL-AQSA MARTYR’S BRIGADES BUYING UP WEAPONS INSTEAD OF FOOD FOR THEIR CHILDREN……. – The Tundra Tabloids……. FATTAH’S AL-AQSA MARTYR’S BRIGADES BUYING UP WEAPONS INSTEAD OF FOOD FOR THEIR CHILDREN……. The reason why these Arab terrorists feel free to steal food from the mouths of their children, is due to the deep seated humanitarian racism in the West that refuses to hold these people to the same high moral standards as themselves. The West continues to send “aid money” to the Palestinian Authority, all the while they refuse to reform thier society, and why should they? The Western states who supply aid refuse to hold them accountable for anything that they say and do. The EU (as well as the US) refuse to have any kind of strings attached to the aid money they pump into the Palestinian Authory, though knowing fully well of the graft, greed, corruption and the misuse of the funding. It’s a racket allowed to continue due to the racist notion that the Arab cannot be held to Western moral codes and standards, because they are unable to meet them. It’s a lie, it’s racist, and it has to end. The only country by the way, that treats the Arabs as equals, is in fact the Israeli governement, in that they should be held accountable for their actions and to the treaties that they sign. The folly of the West’s humanitarian racism towards the Arabs is that, if they really refuse to believe that the Arabs are completely unable to respect human rights of their own people, how can a sustainable peace between the two sides be acheived if they will never be held accountable for their actions? The West has been guilty over the past 60 years in allowing the Arabs (called Palestinians) to believe that the money will continue to flow, regardless of how corrupt and violent they may be. PMW Watch: Members of Fatah’s Al-Aqsa Martyrs’ Brigades are arming themselves for war against Israel by buying guns instead of food for their kids and by selling their wives’ jewelry, according to the official Fatah website. The website says that the Brigades, the so-called “military wing” of Fatah, are preparing a “harsh and painful” response to any Israeli attacks on Gaza. According to one of the heads of the Brigades, the fighters have to buy their own weapons to replace weapons confiscated by Hamas. Previous Post Previous Post FOX NEWS GIVES US MUSLIM BROTHERHOOD ORGANIZATION CAIR A PLATFORM TO PRESENT ITSELF AS VALID ORGANIZATION……. Next Post Next Post TURKISH PM THROWS DOWN GAUNTLET TO ISRAEL: YOU VIOLATE OUR AIRSPACE AND WE’LL RESPOND…….